EXCLUSIVE…Journalist Allan Nairn Facing Possible Arrest in Indonesia for Exposing US-Backed Forces Assassinated Civilians | Democracy Now! AMY GOODMAN: President Obama dedicated the signing of healthcare legislation yesterday to a number of people, including his mother, S. Ann Dunham Soetoro. PRESIDENT BARACK OBAMA: Today, I’m signing this reform bill into law on behalf of my mother, who argued with insurance companies even as she battled cancer in her final days. AMY GOODMAN: The healthcare legislative process and its frenetic endgame prompted the President to postpone a trip to the country where his mother raised him for several years of his childhood: Indonesia. While his healthcare bill is considered by many a huge step forward, Obama is simultaneously, and with far less scrutiny, taking what many human rights activists consider to be a huge step backward with Indonesia. News is breaking about the role of the Indonesian military in the murder of political activists in the province of Aceh last year in the lead-up to local elections there. Investigative journalist Allan Nairn is facing possible arrest for the exposé that shows the US-backed Indonesian armed forces assassinated a series of civilian activists last year. The story is breaking at a time when the White House is engaged in fierce behind-the-scenes negotiations with Congress on whether to restore aid to the Indonesian military, including one of its most notorious elements, the special forces command known as Kopassus. President Obama had been scheduled to visit Indonesia this week, but the trip was postponed until June due to the healthcare debate. Since Allan Nairn broke the news of the assassination program here on Democracy Now! last Friday, the Indonesian press has been buzzing with the allegations. A military spokesman told the Jakarta Globe that the military is considering legal action against Allan Nairn. Earlier today, Allan issued a public threat — a public challenge to the Indonesian military to arrest him so that he could face off with the military in open court. Allan Nairn is no stranger to the Indonesian military. In 1991, Allan and I survived a massacre in East Timor, when more than 270 Timorese were killed by US-backed Indonesian soldiers. In 1999, Allan sneaked back into East Timor and reported on the Indonesian military atrocities there as the Indonesian soldiers burned much of East Timor to the ground. They arrested Allan, but he continued reporting from prison. Well, last night we reached Allan in Indonesia to discuss the latest developments. He also, this general who ran the assassination program, told me that he was an enthusiastic supporter of President Obama’s plan to restore full aid to the Indonesian armed forces, and he then went on to describe in detail his own training by the United States. He says they’ve been training him since the 1980s. He regards them as close partners, and he loves Obama’s plan because he says it will make the partnership still more intimate, in his words. General Sunarko, the Kopassus general who in Timor in 1999 helped run the militias that burned 80 percent of the buildings in Timor, that conducted church massacres, etc., and who now has been running this assassinations program in Aceh, he said that he was trained by the US military, the US Pacific Command, mobile training teams in jungle warfare, logistics and many other subjects, and he said that he was most recently trained by the US in 2006. So he’s a very enthusiastic backer of Obama’s plan to restore aid for the US military, and specifically for Kopassus, the special forces, the most notorious unit of that military. Now, in response to this — a few hours ago, this story broke in the Indonesian press. It ran on TV. The government press agency put out a series of stories about it. Kompas, the main newspaper, had five or six stories about it. And the Indonesian army is now threatening to arrest me. They apparently are threatening to charge me with criminal defamation, which, under various Indonesian laws, can carry a sentence of four to six years. And I welcome this threat. I just put out a statement on my website saying I welcome this threat. They should arrest me, so that we can face — have a face-off in open court. And we’ll describe in open court, before the Indonesian public, how the Indonesian armed forces are assassinating civilians. I’ll detail the massacres, the disappearances, etc. And I will attempt to call TNI generals as witnesses and question them under oath and will also attempt to call US officials as witnesses — US officials from the White House, the CIA, the Pentagon, the State Department — and ask them, under oath, to tell the Indonesian public in a trial why they have been giving arms and training, year after year after year, to an Indonesian armed forces as they’ve been killing civilians. As the US has seen the results of their arming and training of people like General Sunarko of thousands of other top officers, the US has continued to pour in weapons and training to facilitate these murders. So I want to get a chance to put the CIA station chiefs, the US military attachés to Indonesia, the generals from the Pentagon, the national security advisers — maybe the presidents, if that’s legally possible — put them on the stand here in Indonesia in court and ask them, under oath, “Why did you do this? Why have you done this to the civilians of Indonesia?” and ask the same questions to Indonesian generals. So I’m challenging the Indonesian military, if they’re serious, if they really believe their own denials, I’m challenging them to arrest me. AMY GOODMAN: But, Allan, you’re talking about President Obama saying he’s going to restore aid to Kopassus and the Indonesian military. These killings took place in 2009. Were they getting the aid then? ALLAN NAIRN: The Indonesian military has always been getting aid from the US. After the Dili massacre in ’91, which we survived, the activist movement which grew up, including the East Timor Action Network, we succeeded in cutting off much of the aid, and especially after the 1999 massacre in Timor, after the Timorese voted for independence, almost all it was cut off. But there’s always been some. And over recent years, it has been slowly restored. And right now, the Indonesian defense ministry claims that 2,800 Indonesian military people are right now getting training in the United States. The US is now selling some weapons and equipment to the armed forces. The CIA and US — various covert US units have extensive programs going on with the Indonesian military and police. So, yes, they’re getting US backing right now. And Obama wants to strengthen that backing. If Obama succeeds in going ahead with his plan, if he’s not stopped by Congress and the US public, this will effectively be the ultimate green light to the Indonesian armed forces and their dreaded special forces, Kopassus, a green light to go ahead and do what they want to the Indonesian public. And many of the survivors of their terror are very worried about this. AMY GOODMAN: We’ll return to my interview with investigative journalist Allan Nairn in Indonesia in a minute. He faces possible arrest. Stay with us. AMY GOODMAN: We return to my interview with investigative journalist Allan Nairn in Indonesia, facing possible arrest for exposing that US-backed Indonesian armed forces assassinated a series of civilian activists last year. The Indonesian military has publicly denied Allan’s report. A spokesman for the armed forces, Air Vice Marshal Sagom Tamboen, told the Jakarta Globe that the military is considering filing a legal complaint against Nairn. Sagom said, quote, “If he is a good journalist and if he does have evidence, then he should come forward with the information that he has…But the problem is that [Nairn] hasn’t been able to give us any clear evidence or tell us who his sources are. So how can we believe him?” unquote. Well, I asked Allan Nairn to respond to Sagom’s comments. ALLAN NAIRN: Well, first, he should read the article. The article lays out evidence. For example, the Indonesian police made a deal with the military and some other Indonesian officials, who stumbled across this assassination program and who weren’t supposed to know about it, and they actually detained a number of the low-level military and military-sponsored hit men who carried out one of the assassinations, the assassination of a man named Tumijan, who was a palm oil from Nagan Raya in Aceh. In that case, an officer named Captain Wahyu, a soldier named Oktavianus, and at least seven militia members, who work for the TNI, are under detention. I name them in my piece. The commander of the Aceh police confirmed to me, on the record — Police General Aditya confirmed to me, on the record, that these men had in fact been detained for these murders. General Sunarko, the Kopassus general who ran the assassination program, also confirmed to me that his subordinates had been detained for the Tumijan murder. That’s as specific as you can get. Yet, in their response, the Indonesian military doesn’t even mention these detentions, and neither does the Indonesian press, as far as I’ve been able to see so far. There seems to be some fear about reporting — about getting that specific about reporting the full facts about these military assassinations. AMY GOODMAN: Allan Nairn, I want to play for you President Obama being interviewed — I believe this was last Thursday, in the height of the healthcare debate. He had just — was just going to be announcing that he would be delaying his trip to Indonesia. But he did do an interview with Indonesian television. This is what he had to say. PRESIDENT BARACK OBAMA: Obviously, there has been some controversy, in terms of military assistance in the past, but since the advent of democracy in Indonesia, what you’ve seen is the TNI make significant progress, separating itself out from the police, focusing more on broad external security issues, as opposed to internal security issues. And so, we’ve already begun more interactions, and our hope is, is that we can continue to improve on that front. REPORTER: Is that a signal that your administration is satisfied with the military reforms and the resolution of the past human rights abuses in Indonesia? PRESIDENT BARACK OBAMA: Well, I think that the — we have acknowledge that those past human rights abuses existed. 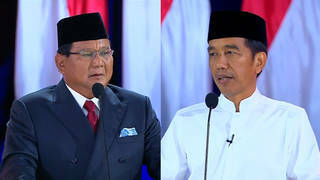 And so, we can’t go forward without looking backwards and understanding that that was an enormous problem, not just for America, but it was a problem for the Indonesian people. We have seen significant progress, and so what we want to do is to continue to improve our consultation and move this forward into a more positive direction, because we want Indonesia to be a close partner for many years to come, and we want a prosperous and secure Indonesia. AMY GOODMAN: Can you respond, Allan Nairn, to what President Obama has said? ALLAN NAIRN: Well, Obama is saying these — he’s saying these crimes were in the distant past. These assassinations that I’m just reporting happened while Obama was president. They happened while Obama was president, while he was presiding over the training of, according to the Indonesian defense ministry, thousands of Indonesian military people. While he was shipping weapons and equipment to the Indonesian military, they were assassinating a political activist in Aceh, as Obama was sitting in the White House. So this is not a thing of the past. Secondly, when he refers to external security issues that the Indonesian armed forces are focusing on, I would challenge the President to name one. There is absolutely no external security threat to Indonesia. Singapore is not about to invade. Australia is not about to invade. What the Indonesian armed forces are focusing on is what they’ve always focused on: the internal repression of the population. And now it’s most intensive in the eastern part of the country, in Papua, which is under de facto occupation. But also, they were doing these — they’ve been doing these political assassinations in Aceh. So what Obama says is just false. AMY GOODMAN: Finally, Allan, President Obama says he will be going to Indonesia in June. What is happening between now and then? How set in stone is the resumption of aid to the Indonesian military? ALLAN NAIRN: Well, that’s a good question. The pact, the aid deal, has not yet been announced. It was due to be announced when Obama was due to be here, in fact probably would have been announced yesterday. And now it’s a bit up in the air. So if the US public and Congress would weigh in now and demand that Obama stop all aid to Kopassus, stop all aid to the Indonesian armed forces, there is some chance that this package could be defeated or cut back. So this is an opportunity. The delay of Obama’s trip is an opportunity to save some lives, prevent some further murders in Indonesia, by again cutting off US aid to this military. AMY GOODMAN: Investigative journalist Allan Nairn speaking from Indonesia, again facing arrest. To talk more about this story, we’re joined by Damien Kingsbury. He’s a professor at Deakin University in Melbourne, Australia, the author of several books on Indonesia, including Power Politics and the Indonesian Military. In 2006, he was on the negotiating team to the Aceh peace agreement. Welcome to Democracy Now!, Professor Kingsbury. If you could briefly talk about the significance of Allan Nairn’s exposé and what is happening now in Indonesia and the US relationship with it, what renewed aid would mean. DAMIEN KINGSBURY: Well, there is already a significant level of military aid to Indonesia. It has been carrying out for a number of years what Allan specifically referred to. And the real problem now is the renewal of aid to Kopassus, the special forces, which, as Allan has correctly pointed out, is guilty of numerous human rights abuses up until, we know for a fact, the end of last year. We also know that human rights abuses are continuing to occur, almost as we speak, in West Papua. So this is an organization that has not reformed and continues to perpetrate the sorts of crimes that the Leahy Amendment, American legislation, bans the United States government from assisting with. AMY GOODMAN: And the significance of the threats by the Indonesian military right now around what Allan has exposed? DAMIEN KINGSBURY: Well, look, if I was Allan and if I was in Indonesia, I think I’d be pretty concerned, because, of course, he’s being very brave, and if he goes to court, he may well have his moment in the sun, but the courts are notoriously corrupt, and the military does hold great sway over the judicial process. So he would not get a fair hearing. He would not get to call the witnesses he wants. He would be found guilty. He would go to jail. I mean, apart from [inaudible], I think they would concoct a visa violation, a crime against him, and that, in itself, would mean that he could go to jail for several years. AMY GOODMAN: But is it possible they would have to then deal with the public being the audience to the exposé that Allan has just done, both at Democracy Now! and at allannairn.com? DAMIEN KINGSBURY: I guess what we’re assuming here is they have the same sort of open system that we have in more developed Western countries, such as the United States and Australia. The reality is that Kopassus officers have been charged with various crimes in the past, and they have even occasionally — not often, but occasionally — taken to court. And what Kopassus does is they stack the gallery. They stop people from entering. They intimidate the judges. And the very few sentences that are handed down are very light, given the crimes that they are up on, which are usually murder and the like. And very often these people are actually exonerated and allowed to go free. So it’s not an open judicial process. It’s not the sort of judicial process that we would expect to see in a developed Western country. And there being anything like a fair trial, I think, would be a very big ask at this stage. AMY GOODMAN: Damien Kingsbury, I want to thank you for being with us, professor at Deakin University in Melbourne, Australia. AMY GOODMAN: Among his books, Power Politics and the Indonesian Military.